Is this a good defense? Or will I get laughed at court? Hi all, I have received a parking ticket and since I have never fought one, I don't know if this defense will pan out (though it is true). Minor question: How do I submit pictures to court as evidence? Do I just print them or do I need to submit to court in prior? The signs were placed in strange way. 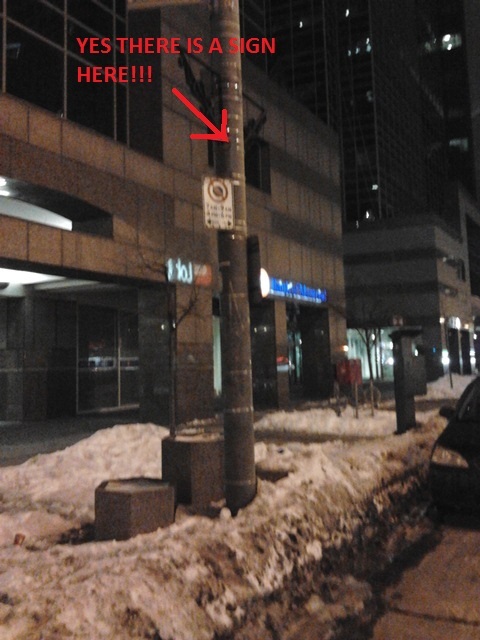 From my angle, I could not see the "no standing" sign (Picture #1). They were posted at an angle completely away from where my car was. When I go the other direction (Picture #2), I can see the sign but this is the only place with signs like this and I took like 10 pictures from other signs where they were all aligned, not at angle like this. Even though I saw the back of the big "enforced pay parking" sign, I was parked at 9:30 PM so I knew I didn't have to look at that, which is why I didn't go around the post to look from that direction. 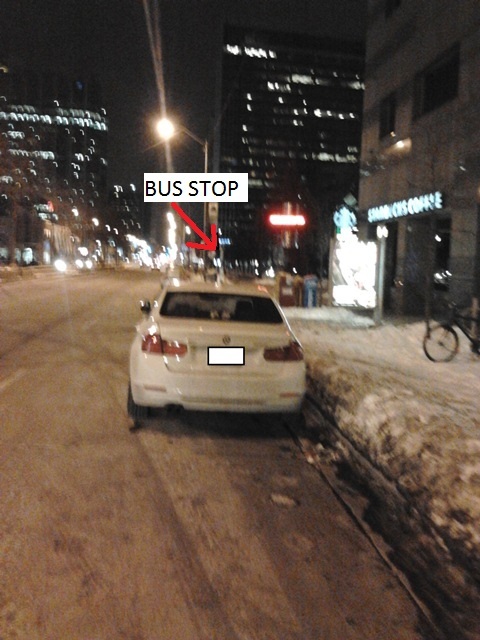 Also, I could not even see the bus stop from where my car was so I really feel it's unfair (picture 3). Thank you for your time. Re: Is this a good defense? Or will I get laughed at court? 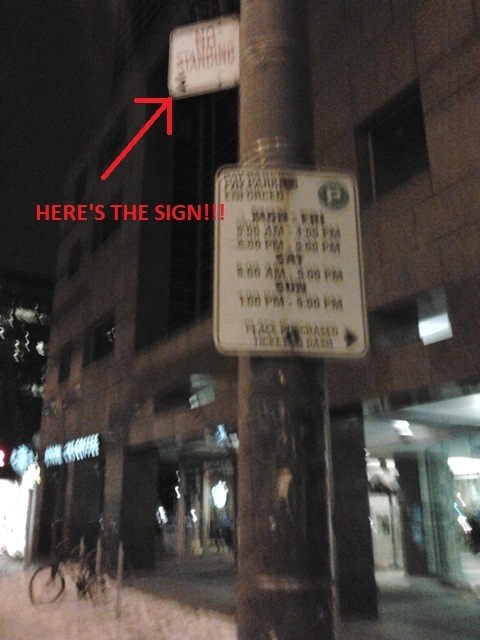 You have to look into your specific city bylaws (i'm assuming Toronto) concerning traffic, parking and signs. There they will state how a sign is to be displayed. This may include such information like the degrees in relation to the traffic running parallel with the sign, height, distance in between signs, etc. That being said, the sign is perfectly placed in relation to traffic. From where you are standing and looking, you are facing against the flow of traffic. Signs are to be displayed towards traffic so you can read them as you drive, not once you pass them. Bylaws will differ slightly on how they can be displayed. They are usually anywhere from head on facing traffic to flat facing the curb (this allows for signs to be placed on walls), and everything in between. They are not supposed to be angled the opposite direction of traffic. You can't park without driving past the sign, and that's why they are required to be displayed like that. They are not required to be angled in the fashion you are requesting. I'd have to say you're out of luck.